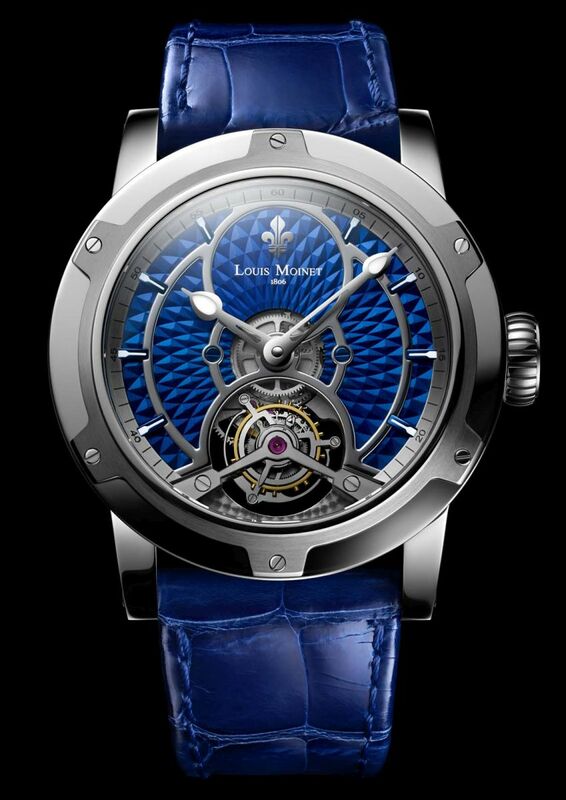 Louis Moinet presents Mogador, which is fitted with the LM-35 movement, winner of the latest International Chronometry Competition (it had to pass four months' worth of tests and sustain no fewer than 150 impacts). "The idea behind Mogador is to combine the energy and harmony of our new brand colors Moinet blue and Polar silver. The result is a powerful, uncluttered creation, showing off the intensity of these hues," explains Jean-Marie Schaller, CEO of Ateliers Louis Moinet. The case, in titanium, measures 45.4mm. It has double sapphire crystals and it is water resistant to 30 meters. Blue inserts on the side of the case. Movement is the Swiss manual-wind Louis Moinet in-house caliber LM35 with 19 jewels, 21,600 vph and a power reserve of 3 days. Functions are: hours, minutes and tourbillon. The dial features a concentric Clous de Paris pattern with luminous hands. It comes on a 24mm blue alligator leather strap with a titanium folding clasp.